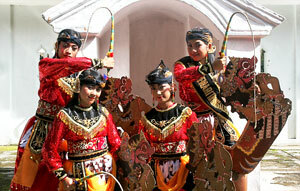 The dance belong to the traditional dance called "jaranan" which is also founding another regions. But Turonggo Yakso has a special made of bufallo's leather. Turonggo Yakso symbolizes the victory of villages in driving away the devil. In addition to the unique imitation horse, the moment of the dance and "gending" (musical composition for gamelan) are also dynamic and energic.